I tested a Peter’s Pedals electric bike. Generally, I was impressed by this bikes' quality and performance. It is highly suitable for commuting. It also works for touring 50 to 60 miles per day. First I'll review the design and quality of the components. Then I'll discuss the bike's handling, i.e. my experience of riding it. This bike has a step-through aluminium frame. It is painted white with blue logos. The frame is relatively stiff. When starting it does not wobble. The battery is housed behind the seat post and locks in place. To remove the battery, you use the quick release to remove the seat post. The battery specification is 36v 10A Lithium Ion. A display, turned on by a push button, indicates the remaining power. Cambridge Electric Transport provide a 1.8A battery charger. A red light indicates charging, a green light means fully charged, which takes 6 hours. Unfortunately, re-charging the battery at cafés is impractical as the charge rate is too low. The Vee Brakes are effective, easy and cheap to maintain. The stopping power is good. Touching the brakes cuts the motor, so the bike quickly stops. For a group, e.g. a cycling club, this feature is bad for those riding close behind. The gears are 6 speed dérailleur. 1st gear is about right. However, 6th gear is too low for touring riders. The remaining gears are about right. They are appropriate for the available power levels. The gear changes are smooth, and the handlebar control is satisfactory. There is a gear selection display. The flat pedals are normal pedals. Experienced riders might replace them with half clips. These improve "location", and prevent feet slipping off the pedals when it rains. I love this bike. It feels really good riding solo. I am going to be really sad to return it. This electric bike is a bit heavy. Starting the bike takes several pedal strokes, before the motor cuts in. This can be a problem when crossing traffic. The trick is to set it into a low gear before you stop. Steering and stiffness is excellent. The computer control is standard for a wheel drive system. I've used a very similar system. However, the time for the motor to cut-in and drop out is too long for riders bunched together, e.g. cycling clubs. The time to cut-in, when you start pedalling, is significant. The motor cut-in and drop-out times are OK for solo touring and commuting. They are not good for cycling club riders. When climbing, the electric bike goes faster than the club bikes. If you suddenly cut the motor power, the power change is significant. This power change is dangerous and highly disconcerting. In addition, the 15.5 mph limit is a legal requirement. On the flat, the bike is not as fast as club riders. The other bike I tried had faster cut-in and drop-out times. Generally, crank-drive system don't have this problem. A level setting on the control panel largely determines the power level. Pedal pressure does not change the power level. The power change when the motor drops-out also does not happen on crank drives. The motor has a free wheel. I tested both low and mid modes. The tests took place on similar days, with little or no wind, on relatively flat countryside. Note that wind affects range, but this applies to all bikes. Overall I find the range amazing and think the specification is excessively conservative. The range in low-mode is about 100 miles. Admittedly, pedalling is fairly hard work, and my speed was around 10 mph. I would prefer 11mph, which could be easily programmed. The mid-mode range is about 48 miles in hilly countryside on a windy day. Actually I rode quite hard for 38 miles, and used about 3/4 of the available power. I easily climbed the hill on Royston Lane, riding out to Littlebury. On a calm day, on flat countryside I achieved about 70 miles. My mid-mode speed was around 14 mph, which is a bit fast. I would prefer 12-13 mph, which again could be easily programmed. In mid-mode, I could climb any Cambridgeshire hill using bottom gear. Max-mode is only useful in very hilly area. It drains the battery quickly. On another ride I tried max mode on Chapel Hill Haslingfield. Max mode was really not necessary. Hence I'd say max-mode is a waste of time in Cambridgeshire. I would prefer the power output to be reduced. The price is fantastic. 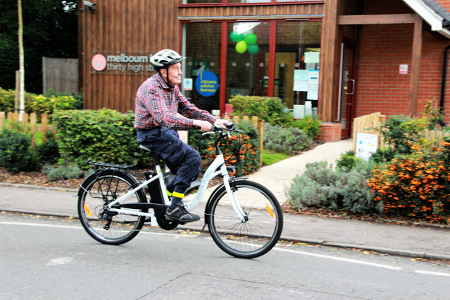 A better bike, that addresses some of the issues, costs over £1,500.